The most abundant sources of world age traditions are indigenous American cultures, every one of which appears to have some sort of variant thereof. The finest example of the North American genre comes from the Hopi of northern Arizona. Although never written down in antiquity their traditions were handed down orally from generation to generation for centuries, and kept a closely guarded secret from the outside world. That is until 1963 when the elders allowed them to be recorded for the first time by Frank Waters, who had since childhood cultivated close ties with various indigenous cultures. Working from the information provided by 30 elders, and especially Oswald White Bear Fredericks, his Book of the Hopi has gained widespread acclaim. Its contents in general demonstrate the deep erudition and spirituality of these people, and anyone who reads it must surely question the long-held view that indigenous tribes around the world are backward or primitive, and that modern technological progress makes us superior. The First People knew no sickness. Not until evil entered the world did persons get sick in the body or head... they understood themselves... were pure and happy... they felt as one and understood one another without talking. Gradually there were those who forgot the commands of Sotuknang and the Spider Woman to respect their Creator. More and more they used the vibratory centers of their bodies solely for earthly purposes, forgetting that their primary purpose was to carry out the plan of Creation... It was then that animals drew away from people... In the same way, people began to divide and draw away from one another – those of different races and languages, then those who remembered the plan of Creation and those who did not. More and more they traded for things they didn’t need, and the more goods they got, the more they wanted… they forgot to sing joyful praises to the Creator and soon began to sing praises for the goods they bartered and stored. Before long it happened as it had to happen. The people began to quarrel and fight, and then wars between villages began. The world, with no one to control it, teetered off balance, spun around crazily, then rolled over twice. Mountains plunged into seas with a great splash, seas and lakes sloshed over the land; and as the world spun through cold and lifeless space it froze into solid ice. More and more of them became wholly occupied with their own earthly plans. Some of them, of course, retained the wisdom granted them upon their Emergence. With this wisdom they understood that the farther they proceeded on the Road of Life and the more they developed, the harder it was. That was why their world was destroyed every so often to give them a fresh start... some of them made a patuwvota (shield made of hide) and with their creative power made it fly through the air. On this many of the people flew to a big city, attacked it, and returned so fast no one knew where they came from. Soon the people of many cities and countries were making patuwvotas and flying on them to attack one another. So corruption and war came to the Third World as it had to the others. He loosed the waters upon the earth. Waves higher than mountains rolled in upon the land. Continents broke asunder and sank beneath the seas. And still the rains fell, the waves rolled in. According to the Hopi this is the world in which we now live. There is much in this narrative that is clearly symbolic and cannot be taken literally, for example the subterranean ant people. The apparently advanced technology of the third race too can probably be taken with a pinch of salt, as we will see in Part 2. But an interesting aspect of the Hopi world age tradition is that each time the race that emerges is ‘given a fresh start’ and so has its spirituality or awareness initially restored. Does any of this provide us with any genuine support for our main themes of a golden age followed by debasement and destruction? We are given no timescales for any of this, so for now let us reserve judgment. These periods are actually extremely short and fall well within our known historical epoch. The first age apparently began 2513 years before its composition in 1558 – that is in 956 BCE – so, given that the first four ages total 2028 years, we would have been 485 years into the current age even by the time it was written. If the other periods are anything to go by the volcanic destruction promised for our current race should have occurred at the latest by the middle of the eighteenth century. Of course 364, the length in years of the wind age, is roughly the number of days in a year, while the length of every age is a multiple of 52, the number of weeks in the year but also the length of a Mayan century as we will shortly see. What is more the length of the second and third ages combined is the same as that of the first and of the fourth. So we can probably assume that these numbers have some calendrical rather than factual significance. Others say that not only the two inside the tree survived the flood, but that other people found refuge in certain caves, and after the flood they came out and they parted from each other spreading all over the world, and the following populations worshipped them as Gods, each in his nation. This is very much a part of the postcatastrophe survivor scenario put forward in chapter 3. But the remainder of this text contains a number of superimposed Christian distortions, including an early race of giants, a ‘tower of Babel’ and a ‘virgin birth’. Molina, Cieza de Leon, Sarmiento, Huaman Poma tell of the making of sun and moon, and of the generations of men, associating this creation with the lake of Titicaca, its islands, and its neighborhood. Viracocha is almost universally represented as the creator, and the story follows the main plot of the genesis narratives known to the civilized nations of both Americas – a succession of world eons, each ending in cataclysm. As told by Huaman Poma, five such ages had preceded that in which he lived. The first was an age of Viracochas, an age of gods, of holiness, of life without death... the second was an age of skin-clad giants, the Huari Runa, or ‘Indigenes’, worshippers of Viracocha; third came the age of Puron Runa, or ‘Common Men’, living without culture; fourth, that of the Auca Runa, ‘Warriors’, and fifth that of the Inca rule, ended by the coming of the Spaniards. As related by Sarmiento the first age was that of a sunless world inhabited by a race of giants, who, owing to the sin of disobedience, were cataclysmically destroyed. Although we can see that these various Central and South American traditions do contain a degree of support for our main themes, in general they are inconsistent even amongst each other, relatively brief, highly symbolic and have been significantly distorted by intrusive Christian influences. * The Dresden Codex mainly contains almanacs of complex and accurate astronomical and calendrical data, for example on lunar cycles and the heliacal rising of Venus. * The Madrid Codex, also known as the Codex Tro-Cortesianus and made up of several parts including the Troano Codex, merely contains divinations. * The Paris Codex shares similarities with the others but is not fully translatable because incomplete. The Dresden Codex is thought to date to the twelfth century because its latest dates for astronomical calculations are for this period, while the other two appear to be somewhat later compositions. The only other Mayan texts of note are the Books of Chilam Balam, various versions of which have been found because each town had its own copy. Although they are in alphabetic script they are similar to the codices, but are somewhat distorted by being interwoven with later Christian infusions. From all these written texts and various inscriptions on steles and temples, scholars have been able to establish the details of the Mayan calendrical system. Their short-count calendar had two types of year – a sacred one of 260 days called a tzolkin, and a normal one of 365 days. Any given day was identified by both systems, so that the calendar lasted 52 years or 73 tzolkins before it repeated itself, and this was the Mayan equivalent of a century. It was therefore supplemented by a long-count calendar in which 20 days or kins made up a 20-day month or uinal; 18 uinals made up a 360-day year or tun; 20 tuns made up a katun of approximately 20 years; 20 katuns made up a baktun of 394.3 years; and longer cycles of 13 and 20 baktuns are also referenced, representing 5125 and 7886 years respectively. [x] It is because the long-count calendar is generally reckoned to have a starting date of 11 August 3114 BCE under our Gregorian system that some people have focused on the start of a new era after 13 baktuns have passed, that is on 21 December 2012, as such a key date. There is also much discussion about whether Mayan cycles are terminated by catastrophes, and all these are subjects to which we will return in the epilogue. The Mayan system leads us neatly on to the most complex world cycle traditions of all – those of the Far East. After the dissolution of the universe, all this wonderful creation again comes into life. Four thousand years have been said to constitute the Krita Yuga. Its dawn also, as well as its eve, hath been said to comprise four hundred years. The Treta Yuga is said to comprise three thousand years, and its dawn, as well as its eve, is said to comprise three hundred years. The Yuga that comes next is called Dwapara, and it hath been computed to consist of two thousand years. Its dawn, as well as its eve, is said to comprise two hundred years. The next Yuga, called Kali, is said to comprise one thousand years, and its dawn, as well as eve, is said to comprise one hundred years. Know, O king, that the duration of the dawn is the same as that of the eve of a Yuga. And after the Kali Yuga is over, the Krita Yuga comes again. A cycle of the Yugas then comprises a period of twelve thousand years. A full thousand of such cycles would constitute a day of Brahma. O tiger among men, when all this universe is withdrawn and ensconced within its home the Creator himself, that disappearance of all things is called by the learned to be Universal Destruction. With the commencement of Brahman’s day the universe begins to start into life. During the period of universal dissolution the Creator sleeps, having recourse to yoga-meditation. When the period of slumber expires, He awakes. That then which is Brahman’s day extends for a thousand such Yugas. His night also extends for a thousand similar Yugas. In the succeeding passages we are given detailed descriptions of the processes of creation and destruction at the beginning and end of each day and night of Brahma. So under this schema humanity on earth is wiped out to start again at the end of each four-yuga cycle lasting 4.3 million human years, while the universe as a whole is completely ‘reabsorbed’ back into its primal state at the end of each day of Brahma lasting 4.3 billion human years, after which it lies dormant for an equivalent period. If we now turn to the later Puranas that were compiled mainly in the middle of the first millennium, again there are 18 major works in this group, although most record similar information. Perhaps the best known is the Vishnu Purana, and here we find the same cycles but with some new information and also some major amendments. [xiv] With echoes of other cultures’ traditions of races of giants and of longer lifespans, it reports that in each yuga humankind’s longevity and stature – as well as virtue – decrease. Then in terms of time cycles it explicitly confirms that each divine year is the equivalent of 360 human years; it introduces new terminology in that a complete cycle of the four yugas is referred to as a maha yuga, and the length of a day or night of Brahma as a kalpa; and it introduces the new concept that each day of Brahma is divided into 14 manvantaras, each of which lasts approximately 71 maha yugas or 308 million years. But the most profound change is the introduction of a year of Brahma, made up of 360 days and nights of Brahma, or 720 kalpas, or 3 trillion human years; and of a life of Brahma, which is made up of 100 years of Brahma, or 72,000 kalpas, or 311 trillion human years. According to the Puranic model, it is only at the end of this almost inconceivably long period that complete reabsorption of the universe takes place. From all this we can piece together the various details in Figure 3. But what are we to make of it all? Arguably to give these cycles any sort of meaningful context we need to split them into two and consider each separately. 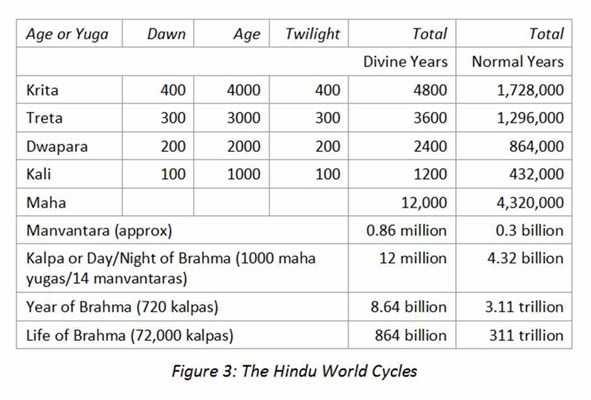 First we have the yuga or what we might term world cycles, but even their time periods are ridiculously lengthy in the context of what we know about human history on earth, even if there was only one cycle. For this reason various modern commentators have attempted to shorten them, with varying degrees of scholarship and success, and even to identify where in the cycles we currently stand. The most important issue is whether or not the years mentioned are normal or divine, because if the former – as suggested by, for example, the Vana Parva – then the time periods become reasonable again. We will return to this issue in the epilogue. But we must then contend with the fact that they seem to describe how the earth is completely subsumed by the ‘waters’ at the end of each yuga cycle, leading to the apparently complete annihilation of humanity even if not of earth itself, and its subsequent reemergence in a new krita age with no period of evolutionary development – again, and again, and again. This must surely be seen as going against all the evidence of multiple disciplines, from archaeology through to geology and beyond. Yet we can surely argue that, if the cyclical element is removed, in general they do provide some degree of support for our main themes of a golden age followed by progressive debasement. We then have the ostensibly separate concept of far longer universal cycles that deal with the dissolution and reemergence of the entire universe at the end of a day, year or even life of Brahma. But in the Vana Parva we not only encounter the theme of how the waters subsume the earth at the end of each yuga cycle, but also of the lotus-boy who is the only thing left and whose stomach contains all the potential for reemergence and recreation – remembering that this flower closes its petals at night and draws back into the water, only to reemerge and unfold in the dawn. [xv] All this seems to bear more than a passing resemblance to the ideas about the emergence of the universe as a whole that are found not only in Vedic but other origin traditions too, as we will see in chapter 8. Indeed in Ray’s translation these passages seem to swap seamlessly between the words earth and universe with little rhyme or reason. So there seems to be a good deal of overlap between the two sets of cycles, at least in the Vana Parva. Indeed a strong argument can be presented that in fact the yuga ages have much more in common with the other non-cyclical world age traditions we have discussed, while the concept of universal cycles should be seen as entirely separate. Indeed in theoretical rather than strict calendrical terms these universal cycles themselves are highly significant, as we will shortly see. But what is more if the concept of divine years is a late and distortive introduction then a year of Brahma lasts only around 8 billion years, as compared with the best estimate of the current age of the universe of around 14 billion years. We would then at least be in roughly the right area in terms of orders of magnitude. [i] These extracts are taken from the lengthy description provided in Waters, Book of the Hopi, part 1, pp. 11–21. [ii] Leyenda de los Soles 75:1–77:32; see Bierhorst, History and Mythology of the Aztecs, pp. 142–7. See also Thompson, Maya History and Religion, chapter 9, pp. 331–3. The narrative contains clear influences from across the Atlantic in that a god tells the flood survivors to hide inside a hollowed-out cypress tree, and when they emerge and cook a fish the gods are angry; this idea of the gods smelling the food that the survivors first cook is found in virtually every Near Eastern flood tradition. [iii] Anales de Cuauhtitlan 2:24–49; see Bierhorst, History and Mythology of the Aztecs, p. 26. [iv] Thompson, Maya Hieroglyphic Writing, chapter 1, p. 10. [v] See, for example, Severin, Gregory, ‘The Paris Codex: Decoding an Astronomical Ephemeris’, chapter 5, pp. 68–9 in Transactions of the American Philosophical Society 71:5 (1981). Among other problems he makes the mistake of assuming that each age lasts 2028 years, whereas this is the stated duration of all four previous ages. [vi] No English translation of this text is readily available, so my source is an Italian version published in 1900; see Il Manoscritto Messicano Vaticano 3738, Detto Il Codice Rios, folios 4–7, pp. 24–5. 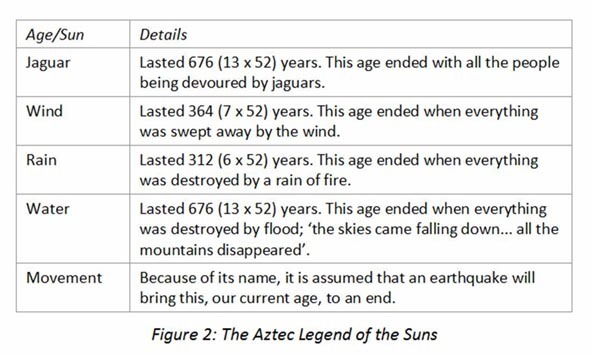 Note that there appears to be some confusion about these numbers: in Maya Hieroglyphic Writing, chapter 1, p. 10 Thompson quotes a total of 18,028 years, while in The Mayan Prophecies, chapter 4, pp. 71–2 Gilbert and Cotterell quote 4081 and 5026 years for the last two ages. [vii] Ibid., folio 4, p. 24. [viii] Alexander, ‘Latin American Mythology’, chapter 7, p. 240 in Gray, The Mythology of All Races, volume 11. The sources quoted are: de Molina, ‘An Account of the Fables and Rights of the Yncas’ translated in Markham, Rites and Laws of the Yncas (London, 1873); Cieza de Leon, ‘Segunda parte de la cronica del Peru’ (Seville, 1553), translated in Markham, The Second part of the Chronicle of Peru (London, 1883), chapter 5, pp. 5–10; Sarmiento, History of the Incas, translated in Markham, History of the Incas (Cambridge, 1907), pp. 27–39; and Pietschmann, ‘Some Account of the Illustrated Chronicle by the Peruvian Indian, D. Felipe Huaman Poma de Ayala’, Comptes rendus du Congres des Americanistes 18 (London, 1913), pp. 511–2. [ix] Thompson provides a useful summary of these in Maya Hieroglyphic Writing, chapter 1, pp. 23–6. [xi] Mahabharata 3.187; see Ray, The Mahabharata, volume 2, pp. 557–8. [xii] Ibid., volume 2, pp. 558–60. [xiii] Mahabharata 12.231; see ibid., volume 7, pp. 235–7. [xiv] Vishnu Purana 1.3 and 6.3; see Dutt, Vishnu Purana, pp. 12–3 and 434–7. See also Dimmitt and van Buitenen, Classical Hindu Mythology, chapter 1, pp. 19–24 and 36–43 and Wilkins, Hindu Mythology, chapter 10, pp. 353–60. [xv] Mahabharata 3.187; see Ray, The Mahabharata, volume 2, pp. 560–2.